Snorkelling Great Barrier Reef… Sailaway invites you to enjoy a day to remember with a reef and island cruise to Low Isles. Product Code: SA-AM. Categories: Daily Departures, Low Isles Cruises. 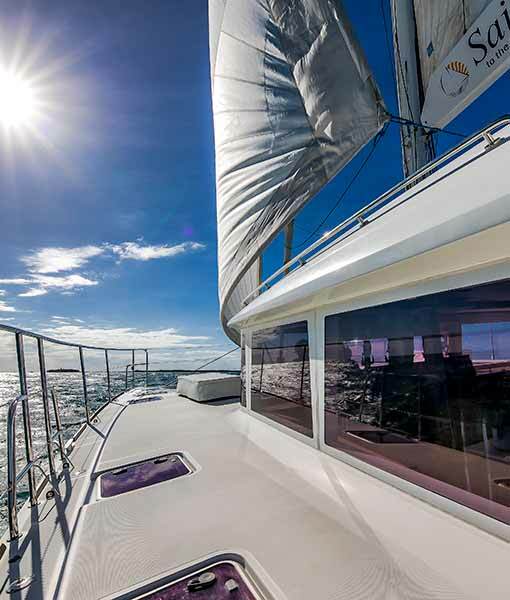 Tags: catamaran tours, great barrier reef, low isles, port douglas, sailing port douglas, snorkelling tours, turtles. Snorkelling Great Barrier Reef. Sailaway invites you to enjoy a day to remember with a reef and island cruise to Low Isles. Explore this protected Coral Cay, with white sandy beaches and coconut palms, surrounded by magnificent coral gardens and the Coral Sea. Sailaway ensures your enjoyment with small numbers of guests, excellent service and personal attention from our helpful friendly crew. Sailaway moors in the sheltered blue lagoon, just relax on the island, join the guided snorkel tour, take a trip on the glass bottom boat or laze on deck before an exhilarating sail back to Port. Condiments; spiced fruit chutney, pesto mayo, sweet chilli sauce and mustard.